My 9 year old is one of the hardest to shop for during the holidays. It seems that she only wants VERY expensive items, and I always want to buy her the perfect gift. 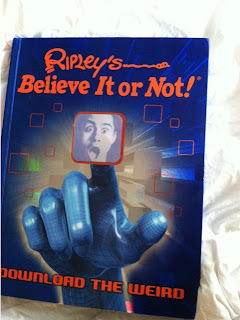 She is very interested in science, so it was not surprise that she loved this book from Ripley's Believe it or Not. It includes all sorts of interesting "weird" items, and has a digital aspect to it as well! MamaBreak received the book above to review here on MamaBreak. We did not receive any other type of compensation. As always, our opinions and experiences are our own.